Bałtyk appears totally different depending on what side it is approached from. A linear building with a concrete, entirely glass-fronted façade and clearly exposed aggregate grain, sets it apart from its surroundings and is an example of a balanced combination of “old” and “new” architecture in the context of the neighbouring historic building of Concordia Design and the Haven. 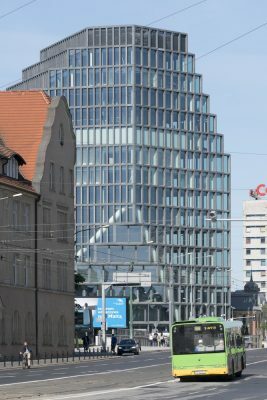 Occupying 16 storeys with an irregular arrangement, and towering over the city centre of Poznań, the building changes its shape depending on the viewing angle. This 25,000sqm building is divided into 12,000sqm office space, 750sqm panorama restaurant with a one room hotel, 1350sqm retail in the plinth of the building and three levels of underground parking. The flexible office space is limited to a depth of seven metres allowing daylight to generously penetrate the workspaces. 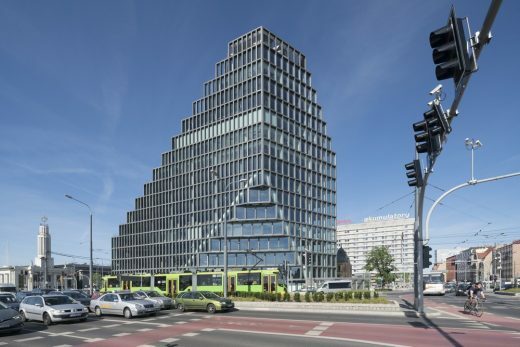 Bałtyk is also a multifunctional building with innovative interior solutions, and scenic terraces offering panoramic views all across the city. In addition to business-oriented functions, the building will house catering establishments, a fitness club, and an intimate jazz club on the 16th floor. Its close proximity to the reopened Concordia Taste restaurant and Haven square creates social functions that encourage meeting and integrating different communities. This results in a form which appears completely different depending on the angle it is approached from. Towards the south, a slope of cascading patios offers outdoor spaces to the users of the building. 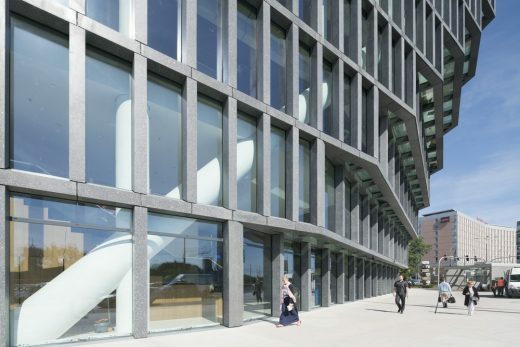 The façade is floor-to-ceiling glass with vertical louvres of glass fibre concrete softening the impact of the sun without losing the vistas over the city and zoo. Site and Program: 25,000sqm mixed-use tower divided into 12,000sqm office space, 750sqm panorama restaurant with a one room hotel and 1350sqm retail in the plinth. Investment corporation Sophia Sp. 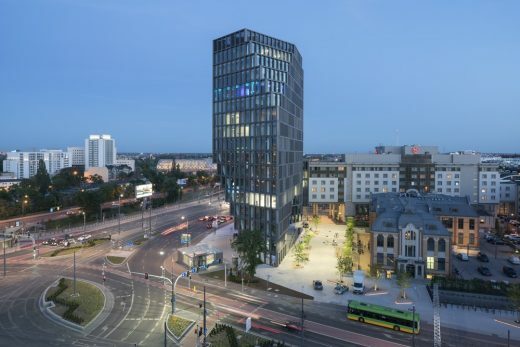 z.o.o and MVRDV present the Baltyk Tower, to be realised in the Polish city of Poznań. 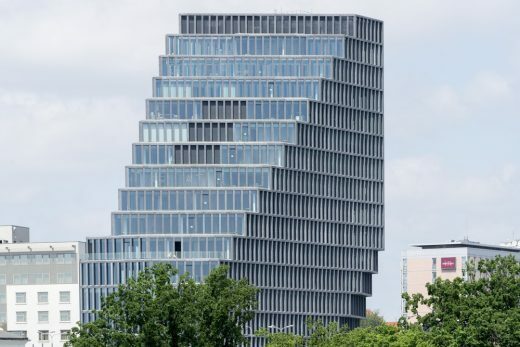 The office tower with a total surface of 25.000 m² will be located at Rondo Kaponiera at the Eastern entrance to the historic city and will feature retail and a panorama restaurant with a proposed one room hotel. Completion is scheduled for 2014. The tower’s volume follows the maximal volume and height restriction of the site. This leads to a shape resulting in a totally different contour when approached from different sides. Towards the south a slope of cascading patios will offer outside spaces to the users of the building. 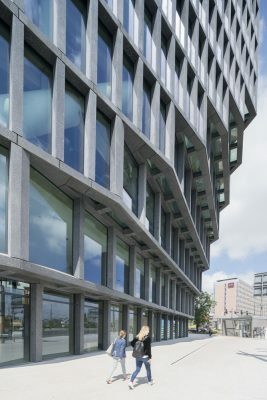 The façade is envisioned floor-to-ceiling glass with vertical louvers of glass fibre concrete softening the impact of the sun without losing the vista over the city and zoo. 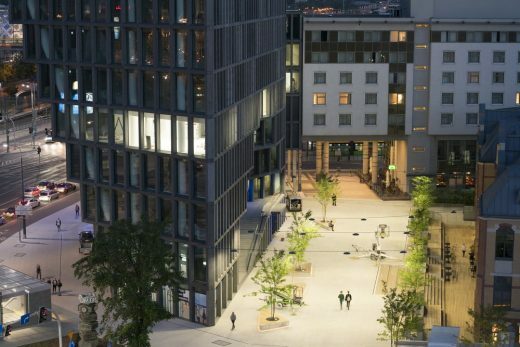 The 25.000m² are divided into 12.000m² office space, 750m² panorama restaurant featuring most likely a one room hotel, 1350m² retail in the plinth of the building and three levels of underground parking. The flexible office space is limited to a depth of seven metres allowing daylight to generously penetrate the work spaces. 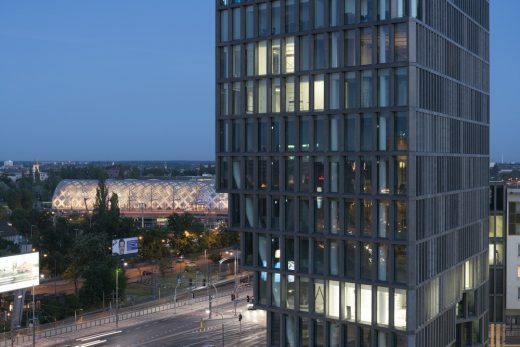 The Baltyk tower will be built at Rondo Kaponiera, a major intersection next to the central train station and the road towards the airport. The building will benefit from the close vicinity of the Sheraton hotel, the currently restored Concordia printing house, a new creativity centre for business and the MTP international fair building. 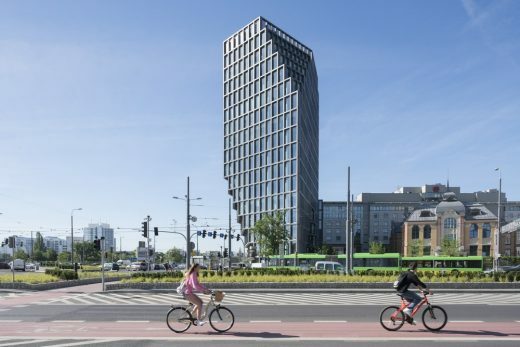 Baltyk tower is the first building by MVRDV in Poland. Sophia Sp. z o.o is a joint venture of Garvest and Vox Group. BuroHappold is structural engineer, MEP and sustainability advisor for the envisioned BREEAM “Very Good” rating. 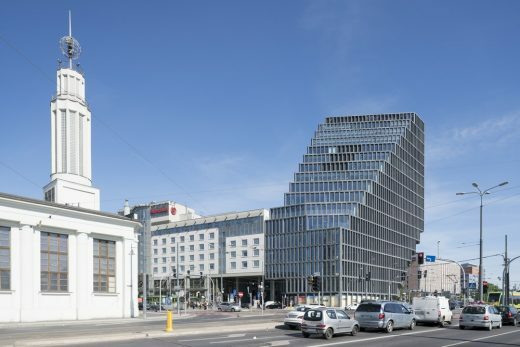 Co-architect is Ultra Architects, a local office from Poznań.